*Signed buyer's order detailing equipment and vehicle model required. Trades are exempt. See dealer for complete details. Our team brings over 120 years of combined automotive experience to the table, and with a robust inventory flush-full of new Chrysler, Jeep, RAM, and Dodge models near Baytown, TX, quality pre-owned vehicles, and a state-of-the-art service facility, we’re ready to be your one-stop shop for all your automotive needs, big and small! We’ve Got Your Next New Chrysler, Jeep, RAM, or Dodge Near Houston! When you choose us as your greater Houston Dodge, Chrysler, Jeep, and RAM dealer, we think you’ll quickly notice that we’re not simply here to sell you a car—we want to connect folks from Atascocita to Houston with the right vehicle for all of their needs. For some, a new Dodge car is just what they need to take on the Houston streets and for others, the added off-roading capability of a new Jeep brand vehicle hits the mark—perfect for getting out to Mont Belvieu for a weekend. Other folks find their daily driving needs are better met by the family-friendly Chrysler Pacifica minivan, while others still need the hard-working, never-quit attitude of the RAM truck lineup. Whatever you need in your next new vehicle, you’ll find yourself well met here at our dealership when you browse our new inventory. Part of our commitment to serving Houston drivers means a used car inventory on par with our new Chrysler, Jeep, RAM, and Dodge inventory. We take exceptional care when picking which pre-owned vehicles appear in our used inventory and only choose to offer the best of the best. That being said, for those Houston driers who seek a little extra level of security, our certified pre-owned inventory promises added peace of mind in the form of dedicated CPO Limited Warranties and other ownership benefits. New or Used, Our Financing Team Will Find You the Right Auto Financing Solution! At other car dealerships, you might have a ton of fun shopping and test driving, only to find yourself stymied by financing or pressured into a deal you don’t feel comfortable in; at Bayshore Chrysler Jeep Dodge, we do things a little differently. Our financing gurus won’t try to trap you or pressure you into a lease or loan agreement that doesn’t feel good—in fact, our team will actually go to bat for you, looking for the most affordable, flexible financing solutions out there. 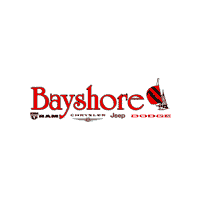 You can count on Bayshore to be on your side—after all, we bring the best of Chrysler, Jeep, RAM, and Dodge to Houston, so you can expect the best financing available, too. All Good Cars Need Good Service—But Don’t Forget About Parts! When you drive home to Houston in a new Dodge, Chrysler, Jeep, or RAM from Bayshore Chrysler Jeep Dodge, it’s tempting to drive off into the sunset without a care in the world—but before you get too far ahead of yourself, keep us in mind for the service and maintenance down the line. New or used, all cars need a little TLC to say safe and road-ready, so when oil-change time rolls around, remember that Bayshore Chrysler Jeep Dodge has a state-of-the-art facility right here onsite, a full parts department, and a team of highly-trained technicians. From Our Family to Yours—See You Soon & Drive Safe, Y’all! Whether you need a little help deciding on the right new Dodge Durango trim or you’re already sure, our team is waiting for you here at the dealership! Bring us your biggest driving needs and we’ll get you matched with the perfect vehicle and on the road in no time! We’re proud to be a part of the Baytown community and beyond, and we love sharing our local knowledge with our neighbors. This is why we’re happy to bring you trusted advice on topics like where to eat in Baytown, TX and much more. Feel free to ask our sales team for more local tips when you visit us!